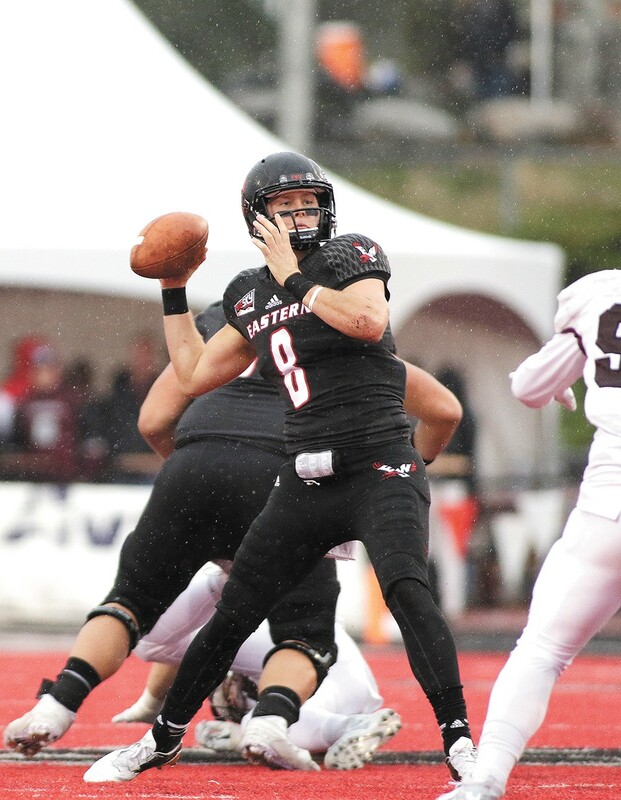 College Football 2017: Is this EWU passer the best college quarterback in the Northwest? Gage Gubrud will try to follow up a record-setting season with a less-experienced receiving corps. The region is awash in awesome quarterback play. On the Palouse, both Washington State's Luke Falk and Idaho's Matt Linehan are building on monster junior years that came with NFL buzz. In Seattle, Jake Browning at Washington was the Pac-12 Offensive Player of the Year and led the Huskies to college football's Final Four. He's a pro prospect as well. Fans of those teams might not want to hear it — and probably won't believe it — but Eastern Washington's Gage Gubrud, our cover boy, might be better than all of them. Granting the fact that EWU's weekly competition in the Football Championship Subdivision isn't the same as those higher-division schools, there's no denying that Gubrud's first year under center for the Eagles resulted in an unparalleled dream season. As a sophomore, he set the FCS record for passing yards in a season (5,160 yards), threw for 48 touchdowns and also led the Eagles in running the ball with 606 yards and five more touchdowns. Oh, and he also led his team to a season-opening win against Falk and the Cougs in Pullman in his first start, announcing his arrival with 474 yards passing and five touchdowns, in addition to another 77 yards on the ground and a sixth TD. Those are video-game stats for a guy who started the season as a relative unknown and ended it as the Big Sky's co-MVP and a third-place finisher for FCS Player of the Year. While Gubrud acknowledges how special last season was, don't expect him to dwell on it heading into 2017, with a new head coach in Aaron Best, as well as a new offensive coordinator and new receivers to break in. "I try not to think about that too much," Gubrud says in a pre-practice interview. "I don't worry about what happened last year because last year is in the past. It was awesome. It was a great year, and I'm looking forward to making this year even better. You're not going to do that resting on past success." It's hard to imagine that Gubrud will repeat the insane statistics of his 2016 season, primarily because he lost three All-American wide receivers to graduation in Cooper Kupp, Kendrick Bourne and Shaq Hill; together they combined for more than 800 receptions, 12,000 yards and 132 touchdowns in their years together. But Gubrud does have six returning lettermen to catch the ball, and the Oregon native says he started throwing with them almost immediately after last season ended with a crushing last-second home loss to Youngstown State in the national semifinals. "Not just in spring ball and fall camp, it happened all in between," Gubrud says. "I'd go out and throw with a bunch of the guys, get a feel for how they run routes, the different speeds of the receivers, their different body languages. Just getting a lot of reps."
Gubrud, a management major who loves watching NFL quarterbacks Aaron Rodgers and Marcus Mariota for inspiration, also knew he had to keep improving his own game to help keep the Eagles competitive in the Big Sky and vying for a national title. "The biggest thing for me was leadership," Gubrud says of his offseason focus. "And then just working on your craft — footwork, accuracy, all the little things that make you a great quarterback. But the biggest thing for me is being a great leader, vocally especially. I've always been the kind of guy to lead by example, but I need to step into that vocal leadership and make sure I have a voice." That voice comes through when he starts looking at the year ahead, and a schedule dotted with road-game challenges like Texas Tech and a trip to New York City to play Fordham, a home game against perennial FCS powerhouse North Dakota State, and the typically challenging Big Sky slate.